We value our loyal customers. When you have purchased 5 or more dresses you are eligible for our GoldMember program. With every purchase of €50 you receive one sticker for the YourDress card. At 30 stickers you qualify for a €150 discount on your next purchase. Simple and easy. To redeem your reward, simply send us your card, and you will receive a coupon code to use with your next purchase. 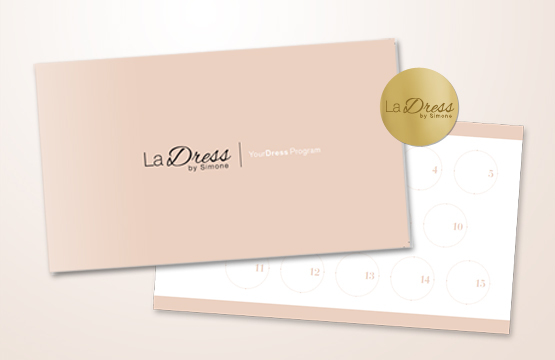 If you'd like to join our GoldMember program or if you'd like to receive more information, please email us at info@ladress.com. When you have purchased 25 or more dresses, you are welcome to join our new and exclusive Diamond program. As a DiamondMember you enjoy the highest level of service, guaranteeing an excellent experience catered to your personal needs. Luxury shopping at its best. Would you like to join our Diamond program or receive more information about this exclusive membership? We'd love to hear from you. Get in touch via personaladvisor@ladress.com.